Cuenca Cigars of Hollywood Florida: Meet Lucrecia Valdez a renowned cigar roller from Tabacalera De Garcia factory here at Cuenca Cigars. Meet Lucrecia Valdez a renowned cigar roller from Tabacalera De Garcia factory here at Cuenca Cigars. Come and meet with Lucrecia Valdez this coming December 12, 2014 at 6:00pm. Learn from a master roller how to make a cigar. Unique opportunity to meet and witness renowned roller - Lucrecia Valdez who will be rolling Montecristo cigars here at Cuenca Cigars in Hollywood Florida. 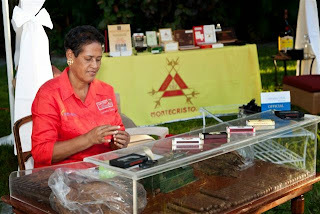 Lucrecia is one of the most experienced and renowned cigar rollers from Altadis’s Tabacalera De Garcia factory, located in La Romana, Dominican Republic. She rolls cigars for some of the most famous and iconic brands in the world, including Montecristo, Romeo Y Julieta and H Upmann. Have an opportunity of smoking a fresh, hand-rolled Montecristo and take advantage of great deals on all of your favorite Altadis brands. Tabacalera de García S.A.S., one of the largest employers in the Dominican Republic, is the embodiment of tradition and pride. The production of tens of millions of superior cigars, year in and year out is a stunning achievement, and is made possible only by a special coherence of directorial vision, managerial humanity and efficiency, and the highest possible standard of skilled craftmanship.